Every Thousand Oaks city council meeting agenda packet contains at least 20-30 items. Each agenda item must go through a thorough review process before it is approved and included on the agenda. Here is how the city took this arduous, manual process and automated it with Laserfiche Workflow. In the past, the submitting department would email a copy of the agenda item to all three departments. Each department would review the document independently and make comments/changes. Some would make the changes directly in the electronic document while others would print out the document first and send back written comments. The submitter would then receive three different versions of the marked-up documents (some electronic, and some paper). The submitting department then had to incorporate all of those changes into the agenda item. Occasionally the comments from one department would conflict with changes requested by another. On occasion, the updated agenda item was then resubmitted to the reviewing department for another review. Once approved by all three departments, the item was then submitted to the City Clerk and the process continued until the item was finalized. The City Clerk would print all the finalized agenda items and manually compile the agenda packet. The agenda packet was then scanned into Laserfiche where it was OCRd. A city employee would then perform quality control on the entire document (averaging 500-700 pages) to make sure that it was scanned correctly. The printed agenda packet would then be sent to a print shop that would scan it in again, and print out at least 30 copies for distribution to council members, the public and other staff. Laserfiche Workflow automated and streamlined the entire agenda packet review/approval and generation process. Now, after the agenda item is written, the submitting department imports it into the department’s For Submission folder in Laserfiche. During the import process, the submitter fills out the document’s metadata including Meeting Date, Title and Agenda Section. The submitter also changes the value of the Submitted field from Pending to Submitted. 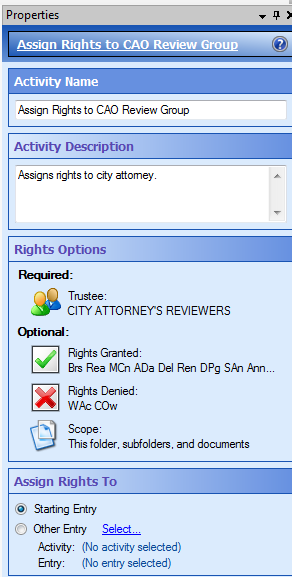 Laserfiche Workflow routes the agenda item to the submitting department’s Pending Approval folder and creates a shortcut (and assigns appropriate entry access rights) in each of the three reviewer’s folders (City Attorney, Finance Department and City Manager). Laserfiche Workflow notifies each reviewing department by email of new items that require attention. Since all three departments will be reviewing and making comments/updates in the same Microsoft Word document, City Manager review is completed last to avoid creating conflicts. Approved: agenda item is approved as is. Additional Info Needed: agenda item needs changes and must be resubmitted afterward for another review. Conditionally Approved: agenda item needs minor changes but does not need to be resubmitted for another review afterward. The reviewer also includes any comments in the appropriate Comments field. If the agenda item is approved by all three reviewing departments, it is routed directly to the City Clerk for final review. If the Additional Info Needed or Conditionally Approved option is selected, the submitter is notified of this decision by email and the value of the Submitted field reverts back to Pending. The submitter makes the required changes and updates the value of the Submitted field to Submitted. If additional info was needed, the agenda item moves through the same review process outlined above. If the item was conditionally approved, after being updated it is routed to the City Clerk for a final review. The City Clerk is notified of agenda items for review. After reviewing it, she must change the value of the City Clerk Approval field to either Approved or Additional Info Needed. If additional information is needed, the submitter is notified by email and has to make the changes before resubmitting. Once approved, the original is moved to the City Clerk’s processing folder where City Clerk staff merges the agenda items (report and attachments) and to assemble the agenda packet. At this point, the agenda item leaves the workflow process and can no longer be accessed by the submitting department. City Clerk staff converts all merged documents to TIFF images to store in the repository. The finalized agenda packet is distributed by email to city council members, department heads, deputies and other staff members. 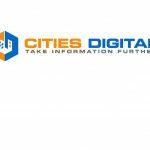 It is also made available to the public on the city’s website through Laserfiche WebLink. The print shop accesses an electronic version of the agenda for the limited packets now being printed. The backbone of the new automated process is Laserfiche Workflow. 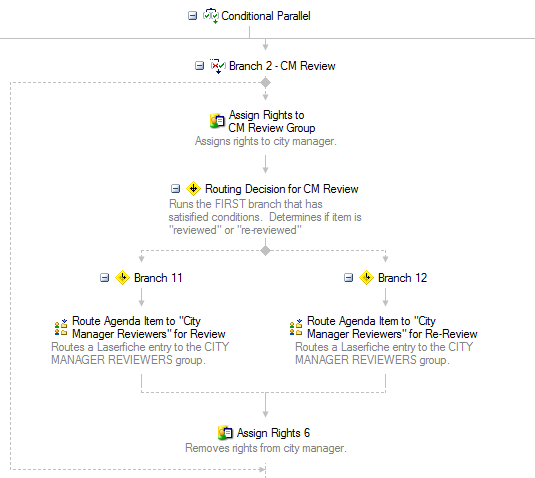 One workflow runs behind the scenes routing agenda items for review between the various approvers. When designing this workflow, we had to take into consideration that not all departments have to review the agenda item a second time. In order to make sure that this is the case, we use the Conditional Parallel activity. Here is what the City Manager review branch of the Conditional Parallel activity looks like. It was also important that only the people who have to work with the document at the time, such as the submitter and then the reviewer, could modify it. We used the Assign Rights activity to assign rights to the appropriate individuals and then remove them after their tasks are completed. When the agenda item has been approved by everyone, the submitter is notified by email. To make sure that the workflow does not terminate, if an email cannot be sent, we’ve enclosed the E-mail activity within a Try-Catch activity. 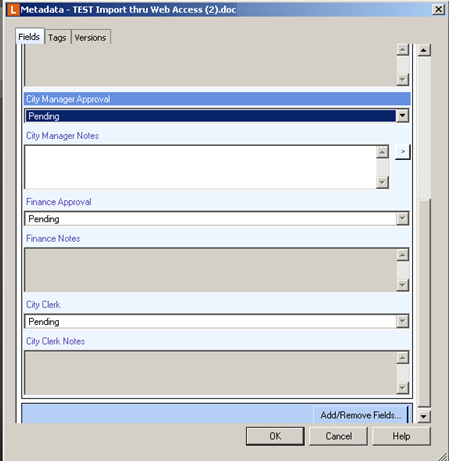 Since the same workflow processes both new agenda items and those that need another review, the starting rules are configured so that the workflow is invoked when an entry is created, changed or moved. The city eliminated two scanning sessions (one by the City Clerk department and one by the print shop) that used to take up to eight hours by compiling the entire agenda electronically. The print shop now receives a PDF version of the agenda and packet to print only ten copies. Reviewers receive the documents in their native format allowing for changes and comments to be tracked in a single document. The final reviewer, the City Manager, sees all comments from the other two reviewing departments. Reviewers no longer have to be at their desks to review the agenda items. They can do so remotely through Laserfiche Web Access even when they’re out of the office. Submitters no longer have to reconcile three different sets of comments and changes to their agenda items before resubmitting for review. All of the comments are now in a single document. Staff can now monitor electronically when the document was submitted and where it is in the approval process. Agendas are now available to the public online through Laserfiche WebLink at 5pm on posting day. Interested in automating the agenda packet process in your own municipality? Get the free, complete guide to agenda management automation.